"I really like seeing how things are made so this trip to the bakery to pick up a cake Jeanette ordered was pretty cool. I got to see where they make the cakes and decorate them. I was glad to get a little behind-the-scenes tour of the bakery. 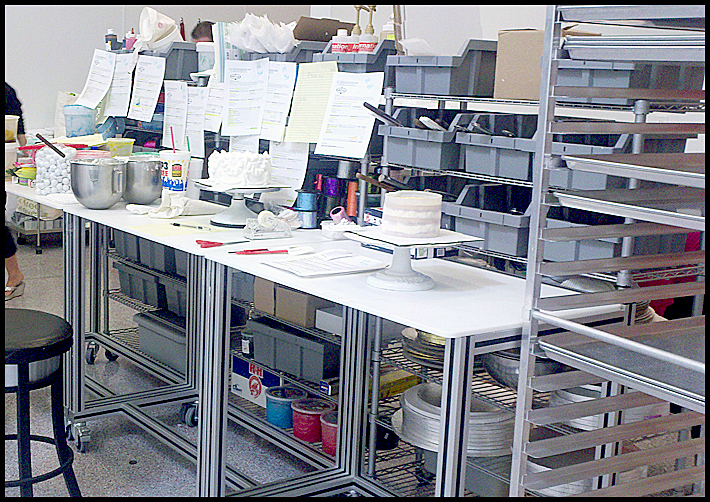 The table in the photo is where they do the final decorations on the cakes. However, the best part is I picked up one of my favorite desserts - a strawberry banana rum cake... We plan on digging into the cake next weekend over the 4th of July weekend. Can't wait." He didn't mention that he could eat the entire thing himself and not gain an ounce! Lucky dog. Can't say I've ever heard of a strawberry banana rum cake but it sounds like the perfect celebration confection for your 4th July celebrations. I had a friend who designed the best cakes ever. I was so amazed by the way he could even write on the cake. I'm craving a slice of that strawberry banana rum cake! Great, now I want cake. lol. Hope you are having a great week and enjoying your desserts!! Thanks for your visit tonight, it's a treat to have you stop by!! Love factories as well. maybe that started with watching the beginning of willy wonka movie! And remember that field trip to carnation?